grandma's cookie jar: Get Ready for February 15th! I know I write this every year, but it is a good reminder and, in case you are new to grandma's cookie jar - great info to have as a grandma, for sure! Valentines Day is just eight days away . . . as you know. 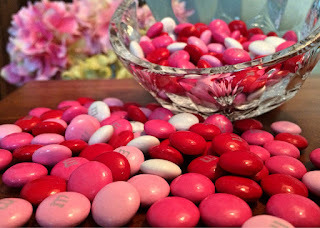 It is an opportunity to create some special memories with things like giving them Valentine's Day cards, havig a special Heart Hunt (hide hearts in your home or outside - weather permitting - and let the grandchildren find them) giving small gifts or even a Valentine's Day Scavenger Hunt - I think I'll do this with my grandsons. Certainly a fun day to celebrate - especially with grandchildren! But, for all the fun February 14th brings, don't forget the wonderful opportunities which are possible on February 15th . . . yes, February 15th! And what, "opportunities" might these be? Well, the opportunity to stock up on sweet heart-shaped treats, because on February 15th the Valentine's Day candies go on sale! This year February 14th is on a Tuesday, so mark your calendar for Wednesday, February 15th and plan to visit your favorite store . . . just think of all the fun things you could do over the coming months with heart-shaped lollipops, heart-shaped chocolates, heart-shaped conversation candies, etc!